his is the 5×4 deer I shot this year in Idaho. I shot him at 450 yards. The inside spread is 24 inches. impressive! looks like a lot of meat went in the freezer from this one. My hubby brings home the "dog" size ones. that sure was one long shot. someone must have taught you to shoot good or you shoot a lot of long range. what unit did you bag this buck in? I see your framepack_- did you spike camp along ways from the jerks on 4x4s? 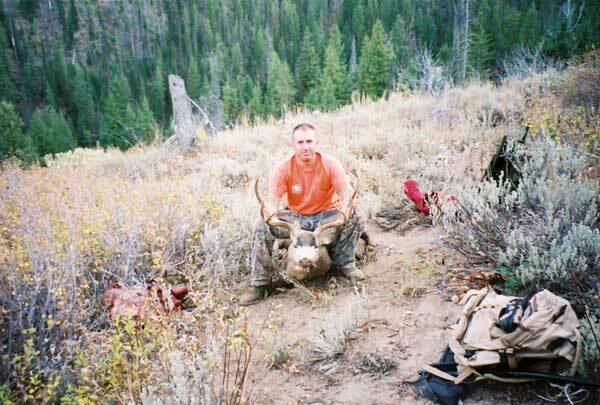 Iv’e come to the realization thats what has to be done.Idaho is getting bad….thats the key in 39,43,38.
great buck ! this year is my year!! There was no spike camp used, I just get up really early in the morrning. 450 yards is a risky shot…with all the downrange wind obviously in his favor on that day!